PRICE REDUCED!! Tropicana Palms 167. This 1152 Sq. 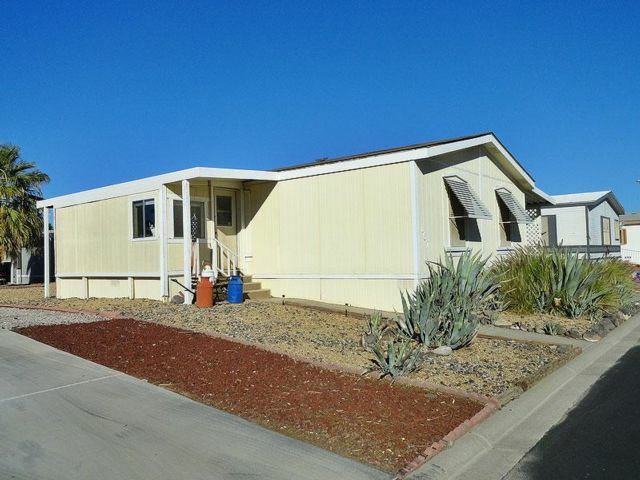 Ft, 3-bedroom 2-bathroom 1990 Fleetwood makes a very comfortable home. It has an enclosed front porch. Enter into the 12x9 Living room with its view of the 12x9 Family room, 8x9 formal dining and kitchen with eating bar. The kitchen includes new side-by-side refrigerator, dishwasher, gas range, corner sink and tons of cabinets. The master bedroom measures 12x11 with a 7x4ft walk-in closet. The master bathroom has a tub/shower combo as does the guest bathroom. The guest bedroom measures 12x10 with a 4ft reach-in closet. The 3rd bedroom is 12x9 with a 4ft reach-in closet. The 6x6 Laundry room has 4 large storage cabinets. There is an 8x10 Tuff shed at end of the 2-car carport and the air conditioner is only 6yrs old. This is a 55+ Manufactured Home Community. The Park is exceptional clean and well kept. A few of Tropicana Palms Amenities: Billiards, 2 Clubhouses, Pool, Fitness Center, Large Screen TV, Planned Activities, Themed Events. A very active Gated Community that borders a Wet Lands Preserve. Lake Mead is just a short drive. Las Vegas Strip, Royal Links Golf Course, Horsemen’s and Dog Fancier's Park are some of the close attractions.